The wonders of Mother Nature are very evident up here in the Tablelands. Millions of years ago it was a hostile place with a lot of volcanic activity. Hence the extremely fertile soils, the beautiful crater lakes, and the amazing countryside scenery. The rolling green fields are very reminiscent of Tasmania. Our Friday adventure took us out to the Danbulla State Forest to another one of Mother Natures stunning creations - The Cathedral Fig. 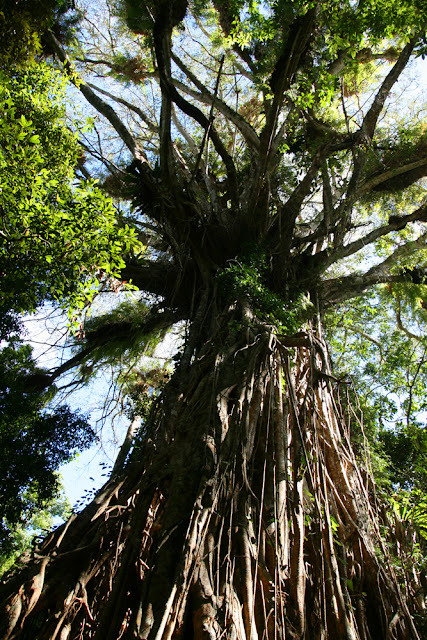 Like the Curtain Fig we saw the other day this tree is a gigantic 500 year old strangler fig. After walking down the 200mt easy pathway through the dense rainforest, the site of this spectacle just takes your breath away, it is like something out of Lord of the Rings. 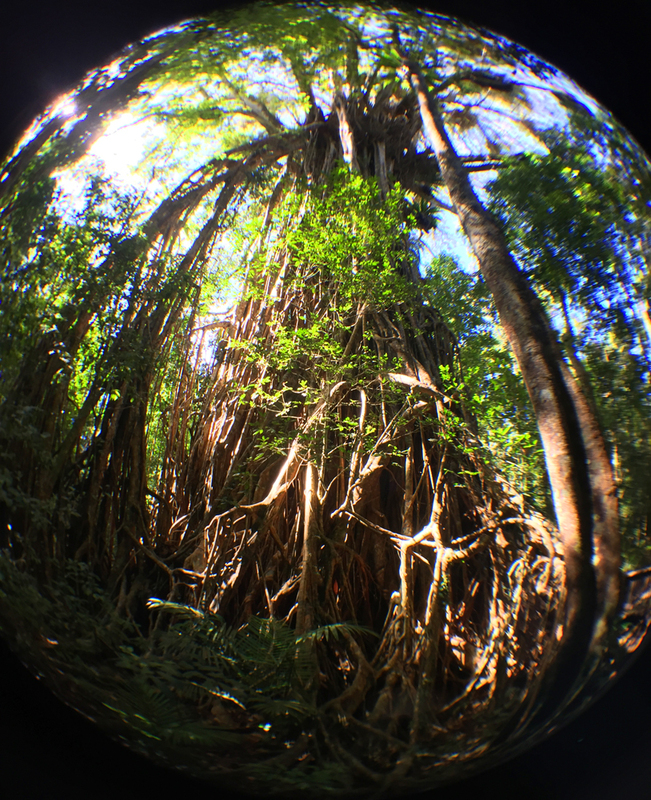 It is almost impossible to get the whole tree in a shot, so I decided to have a go with my fish eye lens for my iPhone. It is advertised to have the reputation of being the best place to hear the early morning birds singing. Well I can say we weren't there early in the morning but there certainly was a lot of birds singing. Next it was onto checkout a couple of the crater lakes. First up was Lake Barrine which was only was only a short drive of the Gillies Hwy. 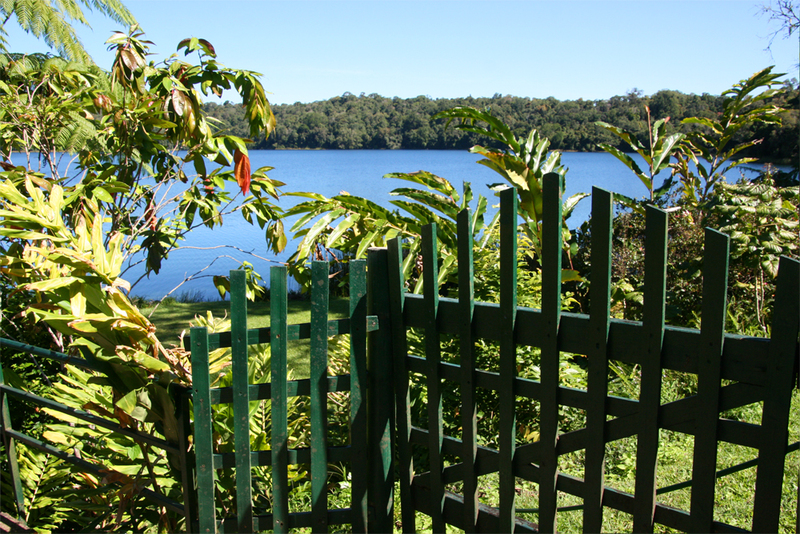 Situated on the lake is the Lake Barrine Tea House where you can go on a scenic cruise and have a delicious Devonshire Tea for $22.00. 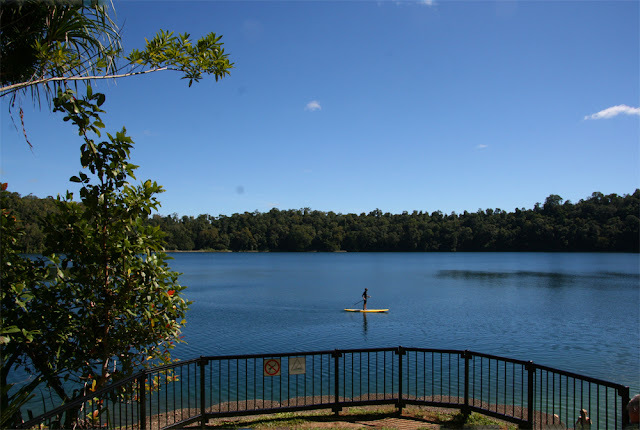 Next it was onto Lake Eacham another crater lake not far off the highway. This lake seemed to be the one where everyone heads for some water activity. There were a few kids swimming and a couple of people paddle boarding. There was also a sign warning that there was a freshwater crocodile in the water and to take care. 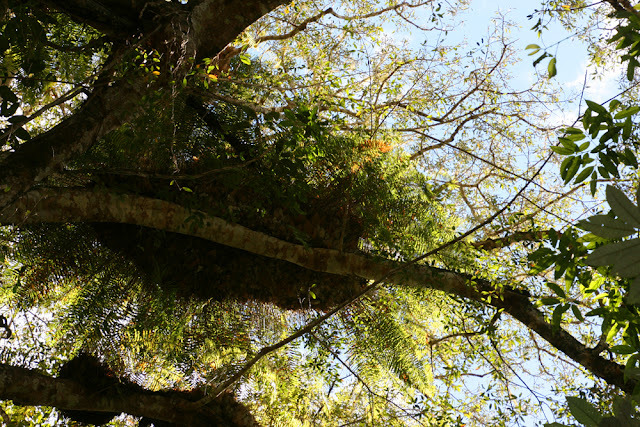 Along with the views and the fabulous produce this area provides we have noticed a few other things about the Atherton Tablelands. The majority of tourist attractions are free, they are just there from Mother Nature for us all to enjoy. Another thing is that there are a few shops that multi-task. In Atherton we went into a coffee shop for a bit of lunch and it was combined with a fabric shop. Actually my perfect shop food and fabric. Then in Yungaburra we found a chemist and fishing tackle shop combined and almost next door was a lolly shop, wedding cars and irrigation shop combined - very convenient for some I guess.